In the Ukraine we have constructed a tilapia recirculating aquaculture system with an annual production of 40 MT. 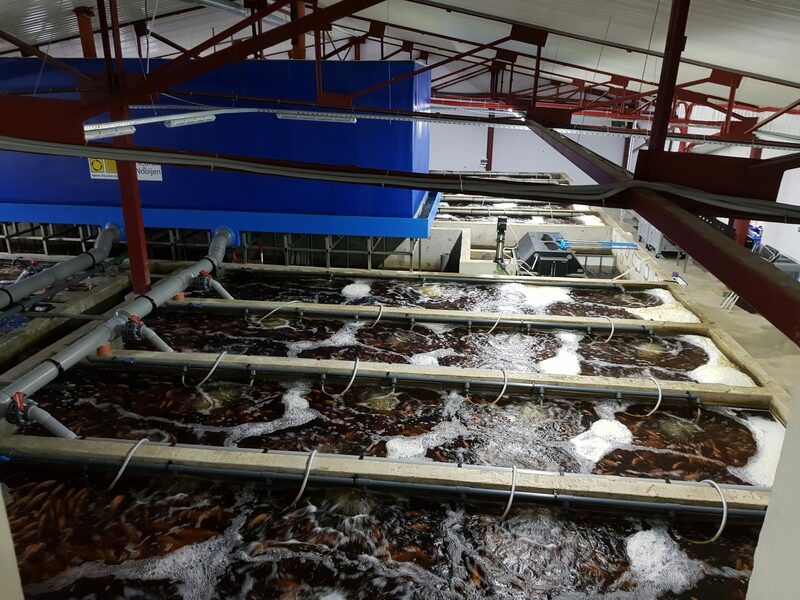 After an initial successful pilot, where Aquaculture ID provided consultancy and filtration technology, Laursen Aquaculture decided to invest in a 40 MT Tilapia production unit with nursery. High costs for liquid oxygen in Ukraine, led to using aeration only to provide oxygen to the fish. This resulted in an innovative design for a RAS Grow Out system based on aeration only, capable of producing Tilapia up to densities of 55 kgs per m3. According to the design of Aquaculture ID a local contractor constructed the reinforced concrete tanks for the system, after which filtration and aeration technology was provided by Aquaculture ID and installed by Aquaculture ID mechanics working together with local contractors.